This past holiday, Epp Concrete, an ECP Contractor Partner out of Lincoln, NE, did something truly amazing for one local family. The idea started brewing back in late 2017 to give back to the local community in some way. The idea formed to repair a local basement as a gift. The president of Epp Concrete, Dave Epp, offered to back anyone financially that wanted to help with the project. “Basement with a Purpose” was a go! The plan was to allow the local community to nominate someone through social media. There were three finalists, and through voting on Epp Concrete’s social media, the winner was chosen. Then Epp Concrete went live to let the lucky winner know she had won! The winner of the vote was Joy Mullendore. Her family calls her the most selfless person that they know. Joy was diagnosed with Stage 3 lung cancer so repairing her basement wasn’t something that she could do, but with her large family residing in the home with her, she really needed the space. Joy never stopped working to be able to provide a home for her family. Because of “Basement with a Purpose” the family would have a safe basement and be able to spread out more in the home. 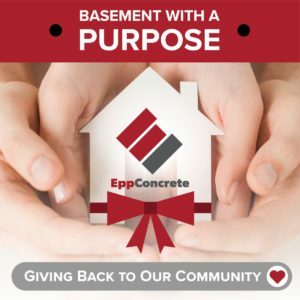 Here is a series of videos from Epp Concrete were you can see where Dave went live to surprise Joy with the gifted basement repairs. It is followed by the big reveal once the project was complete. ECP was proud to be involved in this project, and we feel that Dave and Epp Concrete exemplify the ECP motto of “our Earth, our Community, our Partners”. If you watched the videos you know how truly moving this story is. We are sad to report that Joy lost her battle with cancer. We would like to extend our condolences to Joy’s family and friends and let them know that they are in our thoughts and in our prayers!